Just over a week ago President Donald Trump and the U.S. Pacific Command announced that the USS Carrier Carl Vinson and an attached “strike group” were ordered to steam to the coast of North Korea to display a show of force in an effort to get President Kim Jong Un to back down from plans to test another nuclear bomb. U.S. National Security Advisor H. R. McMaster was quoted by Fox News that the ships were steaming from Singapore toward the Korean Peninsula as a show of force. 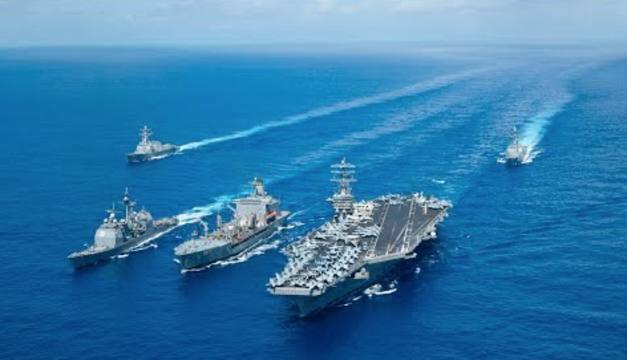 North Korea responded with a warning that it would declare it an act of war and attack the United States if the US Navy displayed any show of force. Since that announcement the world has been holding its breath, wondering if either Trump or Jong Un would back down from what appeared to be a looming standoff comparable to the Cuban Missile Crisis. There was talk of World War III. Then North Korea attempted to fire a test missile but it exploded before it got off the ground. U.S. officials scolded Kim Jong Un but nothing further happened. All this week we waited for the ships to arrive. We waited. And waited. Then yesterday, Defense News published Navy photographs showing the Carrier Vinson passing through the Sunda Strait in Indonesia. The ship and its accompanying strike force was about 3,500 miles away from Korea and steaming in the wrong direction. Trump has remained silent about his lost Naval fleet. Someone from his administration allegedly told CNN that there was a mix-up in communication. Something is really wrong with this picture. We can only hope the United States is never faced with having to fight a real war while Trump remains in office. He obviously does not have a handle on his job, or a real command of his military.